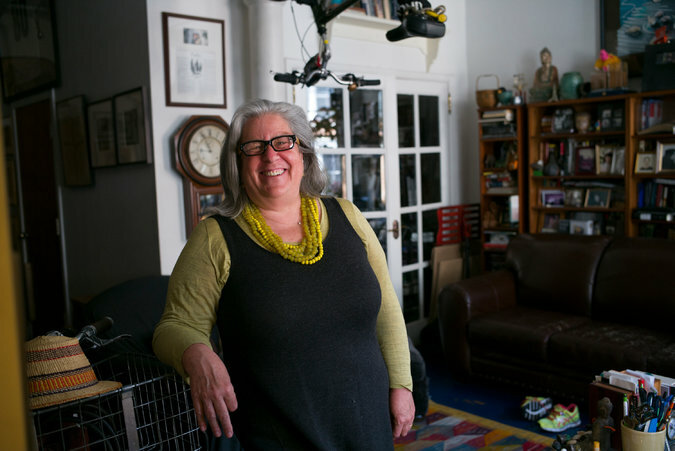 Despite possessing a resume that includes experience as an editor, experimental theater producer, and Wall Street stockbroker, Wicki Boyle felt inspired to begin a new career in her late 50s — in Africa, no less. What would be seen as a daunting challenge for many is an exciting opportunity for Boyle, a woman who relishes in adventures in the unknown (her time spent writing for National Geographic is quite literally an example of this). Boyle is the co-founder of Just Shea, a social business focused on empowering women shea collectors and harvesters in Northern Ghana through the sale of shea-based cosmetics. Just Shea products – lusciously soft salves for feet, hands, face, and lips created from Ghanaian shea butter – are now available both online and in-store in ABC Home. After discussing her life, career, and Just Shea recently, we part ways — but not before she proffers a genuine hug. An appropriate gesture, perhaps: Boyle’s ability to embrace the new with open arms is truly special. Boyle met Just Shea’s founder, Danielle Grace Warren, through The Op-Ed Project (a movement to increase the number of women thought leaders in key international commentary forums). They became friends – frankly, we can’t imagine not finding Boyle instantly companionable – and when Warren informed Boyle she was headed to Ghana, a deeper connection was forged. Eventually, Just Shea was born, a company that is capitalizing on a tremendously underutilized industry while enabling women entrepreneurs to establish true, viable businesses. 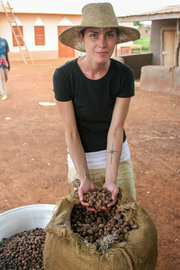 In Africa, shea is known as “womenʼs gold”: Nut collection and processing are designated women’s work. More than 600,000 women collect shea nuts in Ghana, with the industry benefiting more than 2 million individuals (particularly because women tend to reinvest their profits back into their families and communities). Moreover, shea’s rising popularity – it’s seemingly laced in every single cream on the market today – makes it a sector for real growth. Yet over 25% of shea nuts harvested from Ghana’s trees are neither sold nor processed domestically; 60% of the available shea nuts go uncollected. This is largely due to the challenges the women shea nut collectors face, obstacles Warren witnessed firsthand. Boyle explains, “She was seeing that women collecting shea nuts – because it is a women’s job, men will not pick up anything off of the ground – are being bitten by poisonous snakes and scorpions. They don’t have any gear to protect their exposed hands, feet, or faces.” Moreover, as shea collecting often happens at night – so as to not interfere with their daytime responsibilities – they are forced to do so almost entirely in the dark, thus crippling efficiencies. Aside from this gathering gear, the profits for Just Shea help fund other critical logistical elements, such as solar-powered flashlights and silos to store the nuts, allowing collectors to aggregate the crop and sell it year-round (hitherto, many would abandon nuts that they were unable to store). Boyle and Warren have also launched an interest-free loan initiative, which enables women to take out money against a bag of collected shea nuts. This cash advance at the onset of the harvest season means they can hold onto their crop investments and sell during opportune market fluctuations. While empowering women is rewarding for Boyle, creating a truly outstanding product is equally exciting. She comments, “We know that we have to make it twice as good as the next product, because people will not buy something just because it has a backstory — it has to be great.” Their shea butter formula, developed by a New York-based chemist, feels nothing like the heavy, often-sticky products we’ve encountered in the past. It glides on smooth and light, a refreshing — and new — articulation. So, much like Boyle and the many women of entrepreneurs Just Shea, shea butter has taken on a new lease in life — one that feels very, very good. Shop Just Shea, below. Sometimes it is difficult to know if artisans and artists have been treated fairly, paid a good wage and work in safe conditions. But many producers have donned the mantle of doing well and doing good simultaneously and they are offering an array of wonderful gifts which can be purchased on the internet for the holidays. Or be smart and keep this handy guide for birthdays, weddings, Valentines Day or Mom’s and Dad’s Day. Full disclosure here, I am one of the founders of this amazing company. I say that with pride as these high-end skin creams are made from the finest safely harvested, fair-trade shea butter. The women in Northern Ghana are the only ones who gather shea nuts, as shea is a self-sustaining crop harvested from the ground and hence the men consider it trash, and thus women’s work. The women use the money they garner from gathering shea to pay school fees for their children, often their daughters who are less often allowed to go to school than their brothers. The women literally risk their lives gathering the shea nuts as black mombas and vipers abound and they have no protective gear. JUST SHEA was founded to provide women with hats, boots and gloves to protect against snakebites. JUST SHEA pays for this gear by selling high-end creams created to protect Western women’s face, hands and feet. It is a simple elegant solution for one set of women to help another. The folks who began 12 Small Things also produce the beautiful HAND/EYE magazine and website. 12 Small Things, no surprise, offers a dozen quality, handmade, artisan goods from around the globe. The current collection features work form India, Peru, Ghana, Haiti, Africa and Guatemala. The collections support craftspeople working to improve the lives of their families and communities in some of the most challenging situations on the planet. Their stories are those of strength, hope, and beauty, and each product reflects these qualities in the design and craftsmanship. 12 Small Thingsstrives to assist these communities and artisans through commerce. One of our favorites for holiday giving are the magical EBONY VESSELS (photo 2) crafted from sustainably sourced mpingo wood by artisans living in Mozambique’s vast woodlands, these sophisticated storage jars are both useful and beautiful. The unique lids of these stylish lathe-turned jars are a chance for the carvers to show off their skills. Mpingo is the Kiswahili word for the dark hardwood also known as African blackwood or Mozambican ebony and grows prolifically in Mozambique’s forests. Differences in tone and slight imperfections confirm the authenticity of materials and craftsmanship of every vessel. Patti Carpenter was a big time designer working for the likes of Ralph Lauren, Timberland and Bill Blass, when at the flip of the Millennium she decided she needed a different mission. So she quit and began working with artisans, primarily women across the wide world. Her mission was and is to help the incredible artisanal women to hone the design elements of their craft to appeal to markets in the industrialized world. Also check out the DIGS web site in general for other sustainable gifts that give back and offer modern design and eco-friendly ethics, sustainable style and fair trade. Shop their collection of essentials, accessories and gifts for contemporary living, and discover sustainable design for every occasion. They offer natural body care, eco-friendly home furnishings, organic cotton textiles and designer bath accessories to FSC certified woods, fashion accessories, votives and oil diffusers, and natural home accessories. Every DIGS item is made from recycled, repurposed, sustainable or organic materials. Crafted in collaboration with artisans from around the world, DIGS products meet Fair Trade guidelines. The Andean Collection was founded to bring sustainable change to impoverished communities in South America. They offer artisans the opportunity to participate in the global market while inspiring customers with access to the elusive world of the rural Andes. Their motto is – “We Create to Encourage Change”. They also have a non-profit arm, Andean Project, to ensure that this change is productive and healthy and to address other poverty related social issues, all funded through sales and private donations. And for those of you who would like to make a donation in the name of a loved one as the gift for any occasion think about GreaterGood.org is committed to making the world a better place by using simple online ways to protect the health and well-being of people, animals and the planet. GreaterGood.org partners with and funds leading nonprofit organizations around the world in order to alleviate poverty and hunger, promote peace, address cancer and other widespread health problems, foster literacy and provide education, preserve vital habitats in peril, and provide protection and care to vulnerable animals.